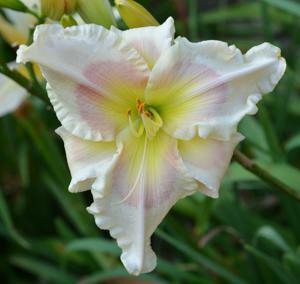 AHS Achievement Medal winner in 2004, CRESTED FRENCH KISS is a pale cream crested double, with a lavender eye, green throat, and both lavender and gold ruffled edges. 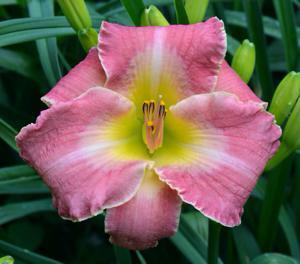 The bloom is 4" on a 24" scape, although it grows to 32" tall, has five way candelabra branching, and up to 40 buds per scape. 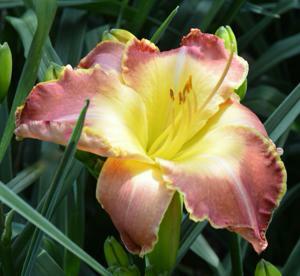 Mid season, extended, it blooms thru August. It's very vigorous and hardy semi-evergreen. 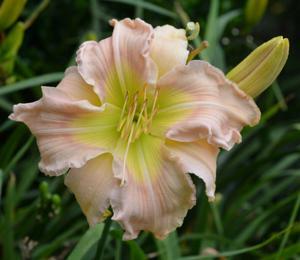 DANCING LIKE A BANSHEE - An Unusual Form, 12.5" bloom, Early Season, on 39" high scape with 4 way branching and 28 buds. 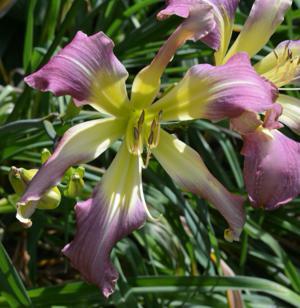 Mauve with red veins, burgundy eye, yellow green throat with white midrib. Semi evergreen, Diploid. Very limited. Call or email for availability. EIGHT FLYING CRANES - Polymerous bloom 95% of the time, with a slight Spatulate, Unusual Form flower. 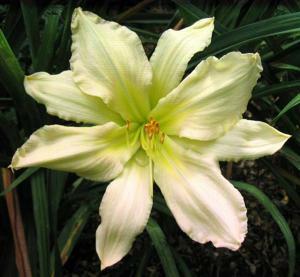 The Pale Lemon Cream bloom has a very pale pink halo and a pale green throat. It's a very flat form, being 7" across, on a 24" scape that's 3 way branched. 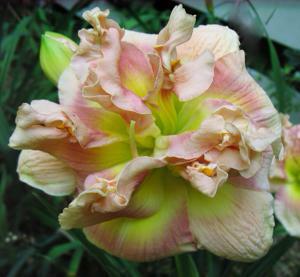 It blooms Mid season, is Dormant and Diploid. 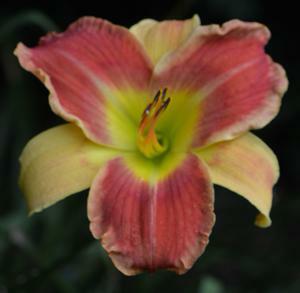 Seedling # 11.00, first bloomed in 2000. 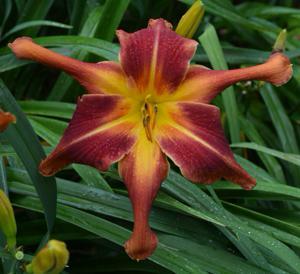 FIRE DRAGON ON THE WIND - A favorite in the garden, it is a Bi-colored, Unusual Form, with quilled sepals. Tetraploid. Blooms are 8" on a tall 40" high scape, with three way branching and 18 buds. 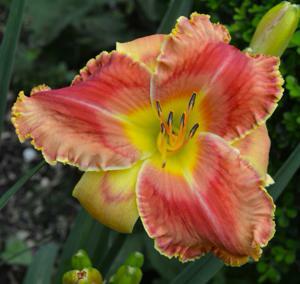 Fire Dragon on the Wind gets it's distinctive color, edge and eye from it's parent Passion's Promise. Petals are a bright lipstick red with with a pale yellow edge. 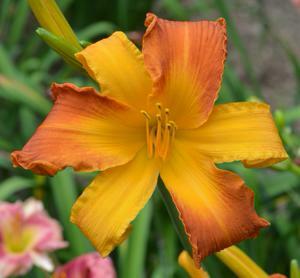 Sepals are an intense yellow, showing a red eye and pale wide edge. It's Semi evergreen, hardy, vigorous, and blooms mid season. Seedling #29.00, first bloomed in 2000. 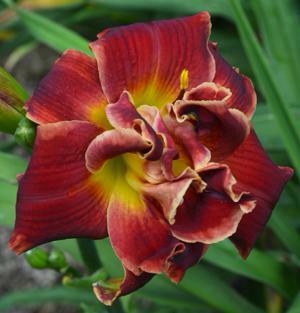 FLYING DRAGON IN A RED SKY - It's a huge 10" Unusual Form bloom, up to 12" when not recurved, out of Passion's Promise. 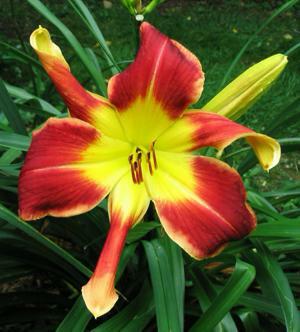 It's an intense red with an orange eye and yellow throat, white midribs and a light edge. Usually with quilled sepals. 26 " high, three way branching with 15 bud count. 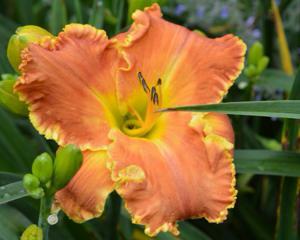 Very striking in the garden, it's never overlooked because of it's size and color. Throws up lots of scapes and has a long bloom season. Tetraploid. 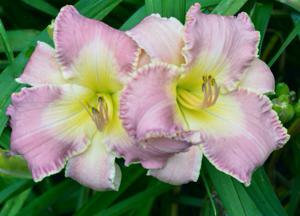 Semievergreen, blooms mid season thru August. 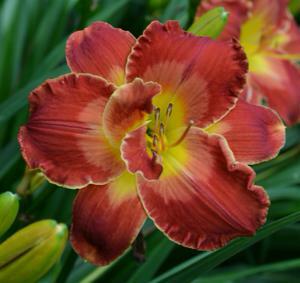 PASSION'S CRIMSON ECLIPSE is a dark, intense, saturated red, with yellow green throat and white edge on petals, sepals and tepals that get bigger as the day gets hotter. 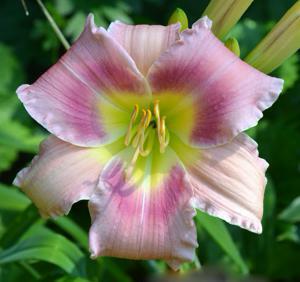 This plant blooms all summer, with 40 buds, and five way candelabra branching. Very, very vigorous. 4.5" Bloom, 36" High. Mid season thru August into September. Semi-Evergreen, Tetraploid. Very fertile both ways. Passion's Promise breeding. sdlg #91.98, first bloomed in 1998. PASSION'S MULBERRY MOON - A very unusual shade of mulberry, with a blue/black eye, veins, and white midribs. It's a 5" bloom, 40" tall, 30 bud count on five way branching. The plant is in very high demand in the garden. It puts on a wonderful show, presenting a huge mound of bloom, starting in Mid season, thru August and continuing into September. Very hardy and vigorous, semi-evergreen. Very fertile both ways. Tetraploid. Seedling #132.01 first bloomed in 2001. WHISPERING CELESTIAL SPARKLER, Unusual Form, Spatulate, Double. 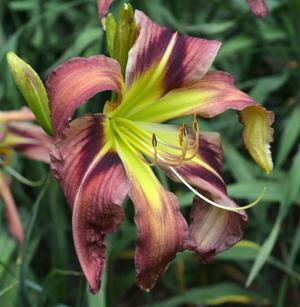 It's petals are narrow and the extra petaloids are very narrow with ruffles and have irregular tips that look like sparklers. 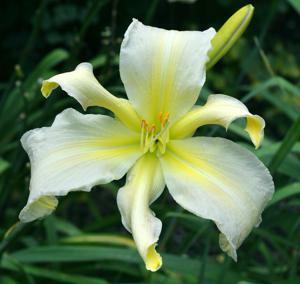 It's a very, very, pale lavender flower, with a very large extended pale lemon throat. 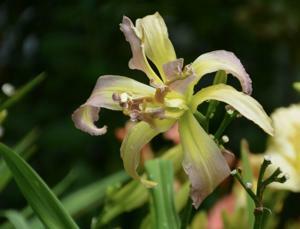 Blooms are about 5.5", with 17 buds, on 3 way branching. Scapes are 40" high. It blooms early to early mid, is usually Semi evergreen but went dormant when the temperature was -09 degrees this past winter with no snow. 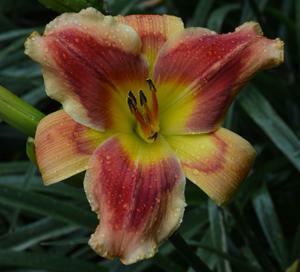 Seedling 14.01, first bloomed in 2001. WHISPERING DANCING SUNSHINE - Unusual Form, Crispate, 7" bloom, with quilled, curling, twisting, and pinched petals dancing on a 36" high scape. 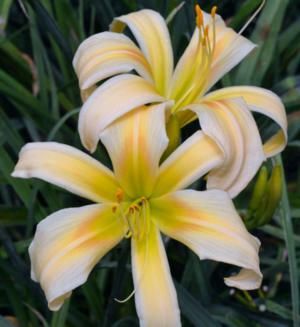 The color is a vibrant, cool lemon with a green heart and pale yellow ruffled edges. It's a vigorous, hardy semi evergreen plant, with 22 buds on 3 way branching. 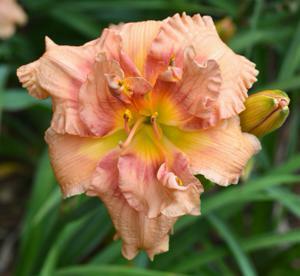 Diploid, blooms mid late. Seedling #101.01 first bloomed in 2001. 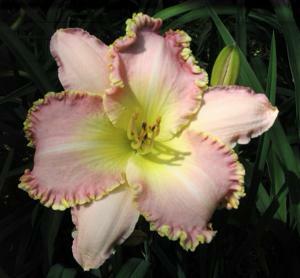 WHISPERING FOUR WINDS - Is a high percent polytepalous, 9", cool pink bloom with light yellow/green extended throat, white midribs and ruffles on the petals. Scape is 38" high with 22 buds on four way branching. Hardy semi-evergreen, vigorous, diploid. Blooms Mid late. Seedling # 13.13 First bloomed in 2001. 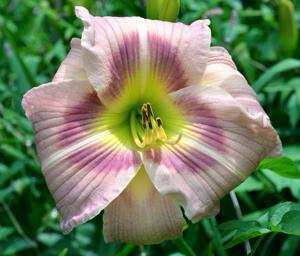 WHISPERING LAVENDER AND LACE - A cool light pink/ lavender with a white eye, pale yellow/green throat and white edge. It has a large, 6" blossom, it's 26" tall, has 19 buds on 3 way branching. Blooming Mid season well into August, it's vigorous, sending up lots of scapes for a great show of bloom. Hardy, Semi-evergreen, diploid. 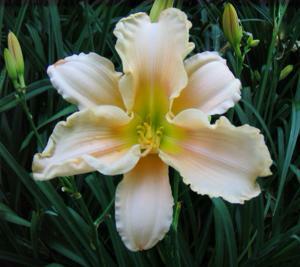 Seedling # 178.98 first bloomed in 1998. 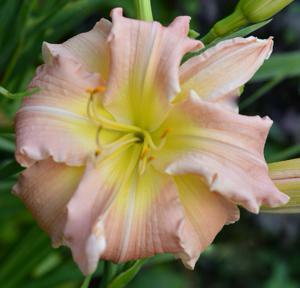 Lovely, distinctive, pinched, pale peach self, with darker blended eye and pale green throat. 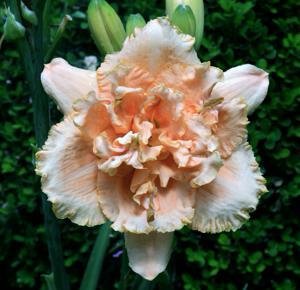 There are ruffles on both the petals and sepals. WHISPERING MAIDEN OF THE MIST has a firm waxy texture and holds up very well. 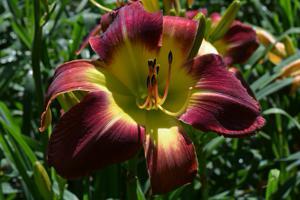 It has 6" blooms on a 40" high scape and when established has 34 buds and 5 way branching. It is a low percent poly, 25% to 40%. Blooms Mid season thru late. Semi-Evergreen, Diploid, Fertile both ways. Passes along it's distinctive coloring and texture to it's kids. WHISPERING PINK FLAMINGO - Unusual Form, Crispate, with a 7" bloom. 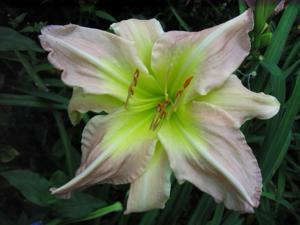 Hot pink with blend from green-yellow to orange throat, lighter pink watermark, and white midrib. Like a flamingo, it's tall on a 40 " high, three way branched scape, with 17 buds. It's a very vigorous, hardy plant, fertile, diploid, semi-evergreen and blooms Early-mid season. Seedling #24.98 first bloomed in 1998. PURPLE FROG PRINCE is tall and statley, just as a prince should be, with it's dark purple self, bright lime green throat, and white mid ribs. The bloom is round and 5.5" when recurved, but 10" when not. 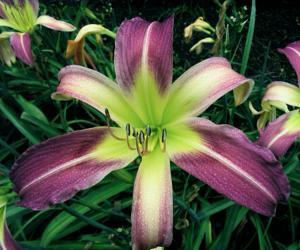 It's 45" high on an upright strong scape, with 18 buds and three three way branching, blooming Mid season into August. A vigorous semi-evergreen, it's diploid, and fertile both ways. The grandparent for much of my "Whispering" line. WHISPERING VIOLET WATER WALTZ first bloomed in 1996, but was never registered until 2014. 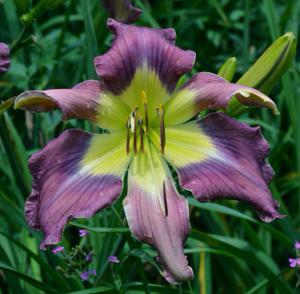 It throws great lavenders, purples, green throats, narrow petals, unusual forms and bi-colors. Also a good polytepalous parent. 10" Bloom, 45" High, 24 buds on four way branching. A great garden plant, increases very well, and very hardy. WHISPERING WHIRLING ENCHANTMENT is an Unusual Form with a personality all it's own. 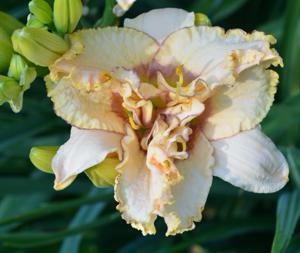 It's a crispate with spatulate ruffled petals and quilled, twisted sepals. Blue lavender with dark blue lavender etched eye and large green throat it has a 5.5" bloom, is 34" high, and has 22 buds on four way well spaced branching. Early-Mid season thru August. Semi-Evergreen, Diploid, Fertile both ways. WHISPERING WHITE TUTU is a Creamy White Double, with ruffled petals that look like a ballerina's tutu. With 5" blooms, on a 31" high scape, it has 14 buds, on three way branching. 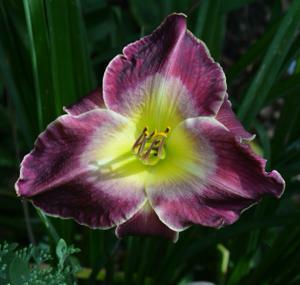 It's vigorous, blooms Early-Mid thru August, sending up lots of scapes. Semi-Evergreen, Diploid. Fertile both ways. Has been a good parent, throwing clear colored doubles for future introduction. 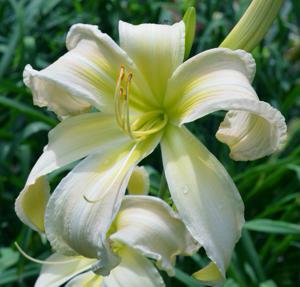 A lovely tall White with yellow/ green extended throat, WHISPERING WHITE WITCH is one of those daylilies that is always consistent and blooms perfectly every time. 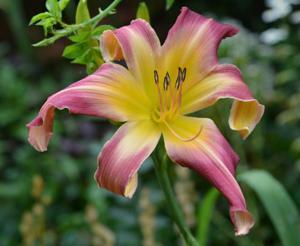 Unusual Form, with spatulate petals and quilled sepals, it has 7" blooms, is 46" high, with 27 buds on 3 way branching. 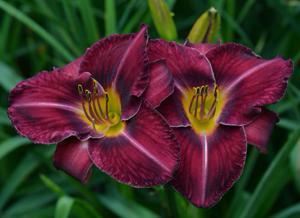 Blooming Early-Mid season, it's Extended blooming well into August. Semi-Evergreen and Diploid, it's fertile both ways, and has been a good parent in my Whispering Line. Full sibling to Wicked White Witch. 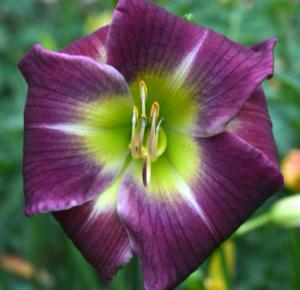 WHISPERING WINGS OF AN ANGEL - Has so many petals that they overlap like feathers on an angel's wing. Bloomed for me first in 2003, and is another of those plants that has sat in the seedling bed out back, until I could get to it and put it in the display garden to see what it could do. - It's a high percent, 99%, polytepalous plant that also goes 5 x 5 about 50% of the time. It's one of those poly's that throws a 3 x 3 once a season just to bug me. The blooms are 6" on 3 way branched, 36" scapes. 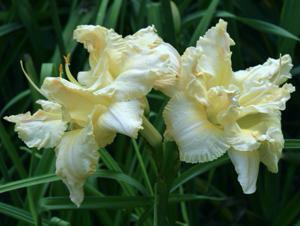 A Diploid, Semi evergreen, and blooms Early mid season. Both pod and pollen fertile. 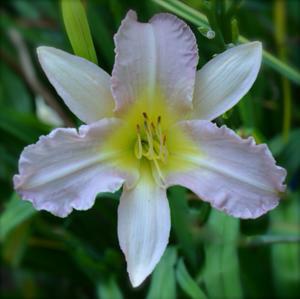 WHISPERING WOODLAND FAIRY - A very pale, clear, cool color of lavender, with a light lemon yellow throat and ruffled petals. 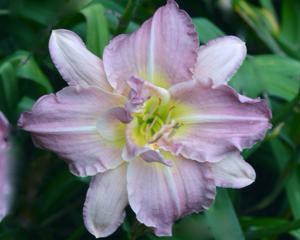 It has 4" blooms, is 36" high, with 29 buds on a well spaced, three way branched scape. 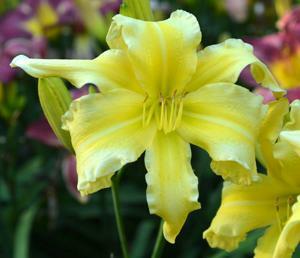 This plant makes lovely, graceful mounds of color from Mid season thru August, and is a great garden favorite. It's being registered because of the great demand for it in the garden. It also has been a good parent for me in my pale lavender diploid line. Seedling #94.97 first bloomed in 1997. This site has been accessed 165588 times.